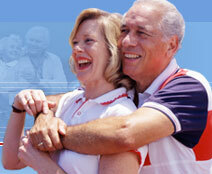 Synflex ® - America’s first choice in liquid Glucosamine! It is very important to compare price per day and not price per glucosamine product, as many companies try to fool you by providing 60 capsules or 32 oz. and not telling you until after you purchased that you must use 6 capsules or 2 oz. per day. Be careful to always compare price per day. Did you know that nutritional supplements like glucosamine are usually absorbed faster and become bioavailable faster in liquid form than in pill form? In addition, with pills you run the risks that binders and fillers in the pills, coatings on the outside of the pills, or the highly compressed form of the pill will cause the glucosamine in the pill to be less absorbable and less bioavailable than glucosamine in liquid form and, as a result, pass through your digestive system without having the intended beneficial effect on your osteoarthritis. Clinical studies have indicated that when glucosamine is delivered into your body in liquid form, it is absorbed more quickly than in pill or capsule form. For that reason, a liquid formula provides faster relief. There are websites being operated on the internet that purport to be neutral in their product evaluations. However, most fail to alert consumers that in fact, they are promoting their own products without fully disclosing their interest. It is our feeling that this is unfair to the consumer. For that reason, we want to advise you that this evaluation is being provided by Synflex America, Inc., the makers of Syn-flex®. We have had years of experience in this industry and our interest is in providing you with information that we hope will be useful in making an informed decision about the product you select. We also suggest that you take a careful look at product comparisons on other websites and try to ascertain who is funding each such website. If someone is failing to disclose their identity on an endorsement, then they may be willing to hide other information important to your purchasing decision. Syn-flex ® 1500 is not recommended for pets. Use only the regular formula Syn-flex ® for pets. Rating Rationale: More glucosamine to an already successful formula and delivered in liquid form to ensure maximum absorption. The 11 synergistic ingredients that have all been shown to aid in the fight against arthritis make this a great product. Plus great new Orange flavor! A good amount of both forms of glucosamine delivered by liquid will ensure maximum absorption. The high quality glucosamine, and 10 synergistic ingredients that have all been shown to aid in the fight against arthritis combine to make a very good product. Rating Rationale: A low amount of glucosamine, unknown quality of ingredients, an alternate system of chondroitin delivery. The product has very little in it besides fruit flavoring. The thing this product has going for it is that it is in liquid form. A good mix of ingredients with a good supply of glucosamine. The glucosamine is glucosamine HCL. It has MSM; there are very few studies of the effects of MSM on humans. Those who advocate using MSM to relieve arthritis pain say that you should take from 1000 mg to 6000 mg per day to realize its benefits. It also has a little Manganese, and 833% of the RDA of Vitamin C, which may cause a severely upset stomach for many. The very high price will rule it out for most budgets, but if you can afford it, it may give you some relief seeing that it is in liquid form. Reminder: glucosamine provided in liquid form is absorbed more quickly, much more fully, and provides greater and longer lasting relief. A note on MSM: There are very few studies of the effect of MSM on humans but some do show that MSM reduces inflammation and pain if taken in an adequate daily dosage. The human studies known to us are by Dr. Lawrence at UCLA who gave the patients 2250 mg per day (750 mg 3 times per day)and by P.R. Usha who gave the patients 1500 mg (500 mg 3 times per day). If you are going to take MSM, it appears that large dosages may be necessary to experience any pain-reducing benefits it may have. There is growing evidence that glucosamine can actually be absorbed through the skin. For that reason, the makers of Syn-flex® also make available a topical analgesic which contains glucosamine. As far as capsule formulas are concerned, we recommend Osteo-Bi-Flex and Cosamin DS, however, we recommend that first you try a liquid glucosamine product with the qualities described above for the reasons stated above. As noted throughout this page, Synflex America, Inc. provides this information. Synflex America, Inc. believes that good quality liquid glucosamine products are more beneficial to osteoarthritis sufferers than are glucosamine pill, powders, or tablets. Among the liquid glucosamine products, Synflex America believes that its product, Syn-flex® is the best for the reasons stated above. You, of course, must exercise your own judgment about which product is the most beneficial at a reasonable cost.